Hurstbridge station is the closest available public transport which is 15 minutes away. The Tregambe family have been making wine for generations in Italy and it is their age-old wine making techniques that head winemaker John Tregambe employs at Nillumbik Estate. Throughout the year, John readily delights visitors with barrel tastings of new vintages or a tour of the pristine vineyard. 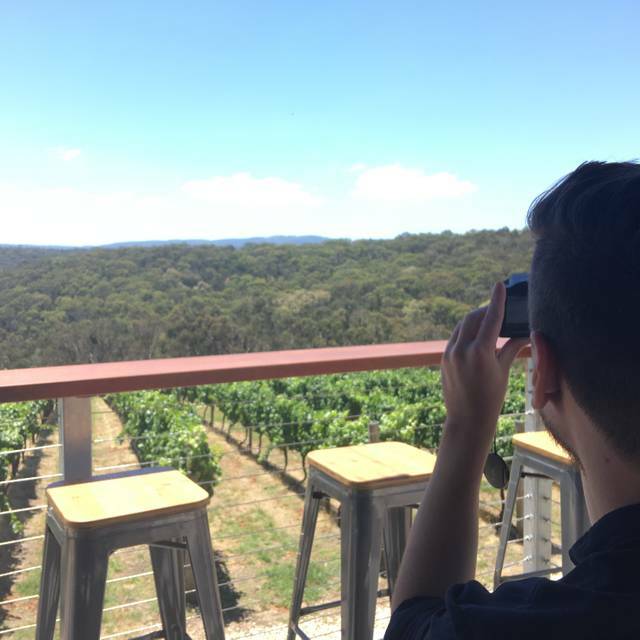 The large deck at the cellar door offers breathtaking views of the Kinglake Ranges; ready to be soaked up with a glass of fine wine and a rustic meal including gourmet pizza's topped with fresh local ingredients and delicious Mediterranean style tasting platters. White chocolate and Nutella base, garnished with fresh local strawberries, topped with icecream and fairy floss, lightly dusted with icing sugar Absolutely yummy! Fantastic wine, service and food. Great spot for the afternoon. All Nillumbik Estate's wines are outstanding. It is well worth doing a tasting. The menu is limited to freshly made gourmet pizzas but they are soooo yummy. My favourite is the mushroom, taleggio cheese and truffle oil. To DIE for!!! The kitchen is very accommodating regarding any food intolerances and allergies. One of my favourite places!!! Perfect location with the most delicious pizza!! Will definitely be back again..
Great food, excellent wine, the views are fantastic, the staff are great. Great location, good food and the vista is great. Can be busy, so book in. What a find! The best pizza I’ve had in a long time with great views and a lovely Shiraz. My only suggestion would be for them to have a basic kids menu (there are no options other than an adult size margarita pizza). Great value. Outdoor seating with sensational hilltop views. Definitely a great casual winery lunch find! We’ll be back. Good Wine, Friendly efficient service, Good food, and fantastic views. Wonderful service and views across the vineyard towards King Lake bush. Terrific quality red wines and rosé. Pizza is the main meal offered. Beautiful toppings, however the bases are average. But affordable and overall recommended. Our lunch at Nillumbik estate was fantastic. The view was amazing and we’ll be back for sure. The food was tasty and reasonably priced. We brought international guest to sample the amazing wines,service and food. They were still raving about the experience for days. Thanks to all the team at Nillumbix Estate. 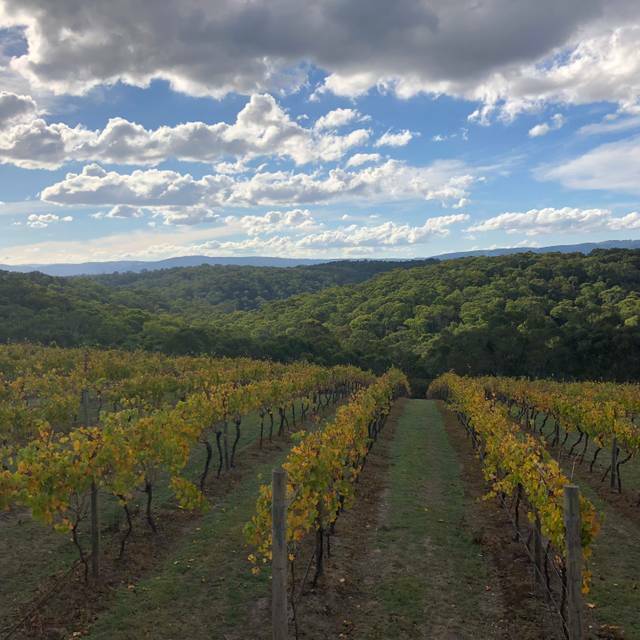 We always enjoy our trips to eat at Nillumbik Winery, we have been going since it opened and have never been disappointed with the beautiful pizzas and cheese and salami platters and of course the wine. We have since moved to the other side of the city but still make the journey to Nillumbik although not as regularly as previously. Always pleasant at this great little winery, staff always very helpful and wine tasting always good. Only criticism pizza bases are not great but toppings are fine , I prefer the tasting plate good variety of cheeses and meats on the antipasto plate. Most importantly there wines are getting better each year. An excellent venue to celebrate our daughters 17th Birthday with family. Love the food ,views and craft beer. The only suggestion would be to have lattes as a coffee choice! Great scenery overlooking the vineyards. We sat inside as raining but still overlooked the outside seating deck and the wonderful view through floor to ceiling windows. Food excellent but mainly pizza I had a very delicious lamb gluten free pizza that my husband also shared and enjoyed even though he normally prefers wheat based pizzas. Family owned and run over many years as well as produce own wines. Staff all very friendly and wine tasting was informative and helped decide wine we would have with lunch. We had one of the reds but there were several we liked. The staff at Nillumbik Winery go out of their way to ensure that you are made to feel relaxed and comfortable. There is no hurry up around the wine tasting table. Cannot recommend this highly enough. Very stingy and rude with wine tasting. Such a small quantity given by lady co-owner that we could not get a proper taste and the stinginess made us then think poorly of her overall approach to hospitality - food, service and facilities. Hi Geoff, so sorry you were not satisfied with your tasting experience. Our tastings are complimentary and we try very hard to adhere to our RSA obligations, which limits the amount we can pour. It’s a shame you didn’t ask for a second taste of any of the vintages, because I would have happily complied. Thanks for giving us a go. Regards, Chanmali Tregambe (Owner). I choose to host my 40th birthday lunch here at Nillumbik Estate after a previous visit with the family and they were able to handle a larger group in the lead up really well and the lunch was seamless. I would highly recommend a visit - The food and the wine is exceptional. Fantastic meal, superb wines, outstanding service and sublime views. A winning combination for this family owned & operated winery. We are so lucky to have this 30minutes from our front door! Relaxing overlooking the vines and mountains. They did everything in their power to make us feel welcome, easy experience and will be back. Great Sunday afternoon with a beautiful view. Relaxed atmosphere with friendly staff. Pizzas are great - we love the broccoli with chilli oil! And you have to try the desert pizza - great way to finish you meal. As usual the service and food was excellent. The wine is second to none, and a tasting is a must. We bought our customary dozen+ and left very satisfied after a lovely family afternoon. John and Chanmali and all the staff are terrific and ensure everyone has a great time. only problem was there was not enough counter service for drinks etc, had to wait too long.Food was beautiful, views were great. As always, it is great to visit this winery and taste the wines as well as chat with the winemakers. On top of great pizzas, this is one of the few wineries that all of their wines are really great! The service here was amazing. We were greeted immediately and very well looked after the entire time. My partner and I do not know much about wine, but the manager (whose name I forgot sorry), made us both feel very comfortable and welcome during our wine tasting session. Excellent customer service and lovely vibe with the added bonus of vegan food and wine! Thank you for offering vegan options and I hope to see more in the future! Great wine and delicious pizza (including vegan). We went with family with ages ranging from 13 to 76 and everyone enjoyed themselves. The location, with its view over the vineyards and distant hills, together with the live music, made for a great atmosphere. Thank you. Booked lunch on a Public Holiday Monday at 1pm. When we arrived the winery was just hitting a peak period with cars and people arriving. The staff seemed a little rushed and distracted with the high level of activity and the need to seat, provide cutlery and menus to dining patrons, whilst maintaining sufficient coverage to attend to those visitors only tasting wine. We ordered our meals and a bottle of the Nebbiolo and proceeded to our outside table (It was quite a chilly day so extra jumpers and hoodies were retrieved from the car). Our tasting platter arrived and, apart from some pre cut and now hard bread, the flavours and ingredients were plentiful and delicious. Our pizza arrived shortly after and it too was fresh and flavoursome. We then returned inside to pay our account and that's when the magic happened. We were fortunate enough to be served by the winemaker. Their was no line of people waiting to be seated or taste and purchase wine. John (winemaker) was pleasant, knowledgeful and engaging. We chatted whilst tasting more wine, and talked with John about matching food options. We then made our purchases to take home. Our overall service experience had been saved by the winemaker himself. The quality of the food and wines were never in doubt. We certainly look forward to our next visit. It is great to know that all their wines are vegan friendly, and on both our visits they made us a vegan pizza which was super tasty. Always have an enjoyable experience when we go for lunch. Great for casual birthday catchups with family. Love the food, wine, atmosphere and of course the view you can never tire of. Great antipasto plate and pizza, and their wine is really nice. Friendly service. We had a fabulous time. The wine tasting was a great way to start lunch. The food was delicious with great value for money. Service was very friendly and the atmosphere calm and relaxing. Booked site unseen which can be risky but it far surpassed my expectations. I took a very good friend out for a birthday lunch to spoil her - she was. The food, service and view were all amazing. Thank you! Nillumbik Estate is one of the best boutique wineries in the Yarra Valley. We had a beautiful lunch to celebrate an 18th birthday and had wonderful platters and pizza’s topped off by cake selections from their new cake fridge. Service was impeccable, ambience was fantastic and the views over the vines through to the Kinglake Ranges made for a very special day. Oh - and the wines are to die for !! Nicely tucked away in a quiet vineyard. Inside and deck dining available. Lovely little separate outdoor area overlooking the pond under the trees available (although we didn't see it till we were leaving. Being a beautiful day outside it could have been offered to us as a seating option). Great pizzas. Absolutely beautiful! !